Circling round and round | More blue fabric? 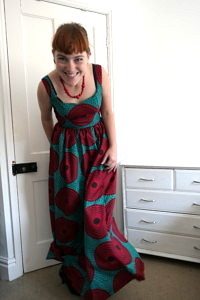 I’ve never really been much of one for maxi dresses, although I’ve often admired them from afar. This summer, I wanted to change that and actually make one for a change, not least because, for reasons I’m not entirely sure of, maxi dresses are inexplicably linked to summer in my head. I had visions of wearing it to summer parties, of swanning around in it whilst wearing lovely sandals, and generally being a vision of summer. In the end, due to the weird absence of a summer we’ve had in the UK this year, this dress has only been worn once (to a barbecue where it then unsurprisingly proceeded to pee it down, which led to some rather hasty alterations). However, next summer? Next summer I’ll be ready…. 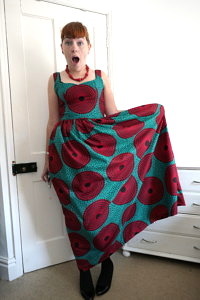 The fabric is an imitation African wax print (it’s way too polyester-y to be actual…) that I got from a stall in Dalston back at Christmas time. 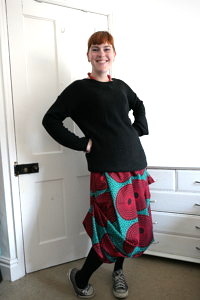 Would you look at the skirt on this? 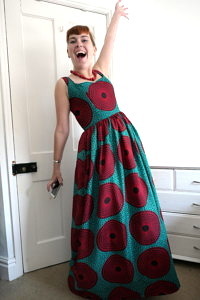 I used the By Hand London Kim dress for the bodice and added a full length gathered maxi skirt. I did a further alteration to the Kim bodice this time, whereby I moved the straps in at the shoulders (I’d found that they previously slipped off). 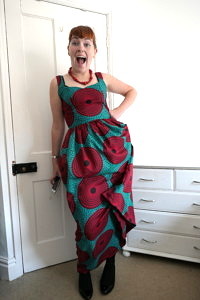 It turns out that I made them ever so slightly too long – something I corrected when I made my birthday dress – but the conquering of the alteration was still pretty confidence building. Pattern placement was a bit of a bum with this dress, not because the pattern isn’t clear (I mean, look at it!) but because it was printed off centre so was effectively on a bit of a bias. There’s also a flaw running through some of the print, but you wouldn’t know if unless you looked for it (and I’m not going to tell you where it is). 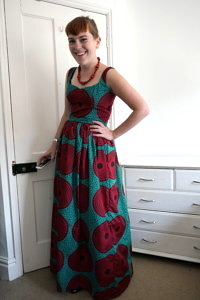 Making a maxi dress was a bit of a new one for me, I generally stick to somewhere around the knees (excluding the ball dress, but, y’know, balls). As lengths go, I liked it more than I expected, but it’s definitely not something that’ll be creeping into my every day wardrobe. As for the bodice, this was – effectively – a final toile before making the birthday dress, and given how well that turned out, I think it’s fair to say I’ll be making the Kim again! ps. The awful weather at the end of the evening? This is how I got around it…. Classy….